In the past, waste edible oils and fats were often used in the production of animal feeds. However due to links between BSE and this practice, the use of waste fats for animal feed is not as common as it once was and this has resulted in surplus quantities becoming available. This has led to significant disposal problems. Waste oils and fats can be used as renewable fuel resources. Conversion of waste oils and fats to biodiesel fuel is one possibility but poses some difficulties such as in the use of toxic or caustic materials and by-product disposal. Conversion to biodiesel may also decrease the economic attractiveness of using waste oils as fuels. An alternative to the use of biodiesel is the use of vegetable oils or rendered animal fats as a fuel. Using relatively unmodified oils or fats eliminates the problems associated with toxic and caustic precursor chemicals and residual biodiesel alkalinity as the oil is used without altering its chemical properties. This paper discusses the use of waste vegetable and animal oils and fats as unmodified fuels in compression ignition engines. Waste edible oils and fats pose significant disposal problems in many parts of the world. In the past much of these waste products have been used in the production of animal feeds. However due to possible links between BSE and this practice, the use of waste edible animal fats for animal feed is not as common as it once was, resulting in disposal problems. As it is often difficult to prevent the contamination of waste vegetable oil with animal products during cooking, waste vegetable oil often must be treated in a similar manner as is waste animal fats. One possibility for the disposal of these products is as a fuel for transport or other uses. Conversion of waste oils and fats to biodiesel fuel has many environmental advantages over petroleum based diesel fuel. However it is not commercially available in Australia and the ‘back-yard’ production of biodiesel may present serious risks as the process uses methanol, a toxic and flammable liquid, and sodium or potassium hydroxide, both of which are caustic. By-product disposal may present further difficulties and environmental considerations may preclude production in sensitive areas. An alternative to the use of biodiesel is the use of vegetable oil or rendered animal fats as fuel. Using unmodified oils not only eliminates problems such as residual biodiesel alkalinity by-product disposal, but also increases the economic viability of using the oil or fat. While the use of vegetable or animal oils and fats as fuels may be somewhat surprising at first, when examined in an historical context we can see that the compression ignition engine, first developed to a usable level of functionality by the French-born Rudolf Diesel near the end of the 19th century, was originally designed to operate on vegetable oil. It was about this time that new drilling technology and exploration techniques were developed and together these ushered in the age of cheap and plentiful fossil fuels. Consequently, the use of vegetable and animal oils and fats as fuels has only been used for a few special purposes such as in racing fuels or in environmentally sensitive areas where petroleum spills tend to cause more serious problems than do spills of animal and/or vegetable derived fuels. After some one hundred years of using liquid petroleum fuels, we are now finding that there are unforeseen side effects, the foremost perhaps being the so-called Enhanced Greenhouse Effect. In Australia, transport use contributes some 16% of Australia’s greenhouse gas emissions. Of this, diesel fuel contributed about 17% or 11,705,000 tonnes of CO2 equivalent. An additional 1,622,000 tonnes is released from diesel fuel used for electricity generation. On top of greenhouse gas emissions is the vexing question of how little – or much – is left. However oils of vegetable and animal origin, unlike fossil fuels, have to potential to be produced not only on a sustainable basis but also could be greenhouse gas neutral, or at the very least, emit substantially less greenhouse gases per unit energy than do any of the fossil fuels. Experience has shown that the use of unsaturated triglyceride oils as a fuel may cause significant problems that can affect the viability of their fuel use. But this is not always the case and in many circumstances these problems can either be dealt with or are acceptable to the user. The viscosity of plant and animal fats and oils varies from hard crystalline solids to light oils at room temperature. In most cases, these ‘oils’ or ‘fats’ are actually a complex mixture of various fatty acids triglycerides, often with the various components having widely varying melting points. This may give the oil or fat a temperature range over which solidification occurs, with the oil gradually thickening from a thin liquid, through to a thick liquid, then a semi-solid and finally to a solid. High melting points or solidification ranges can cause problems in fuel systems such as partial or complete blockage as the triglyceride thickens and finally solidifies when the ambient temperature falls. While this also occurs with petroleum based diesel, particularly as the temperature falls below about ~ -10 to -5° C for ‘summer’ formulations and ~ -20 to -10° C for ‘winter’ diesels, it is relatively easy to control during the refining process and is generally not a major problem. Many vegetable oils and some animal oils are ‘drying’ or ‘semi-drying’ and it is this which makes many oils such as linseed, tung and some fish oils suitable as the base of paints and other coatings. But it is also this property that further restricts their use as fuels. The traditional measure of the degree of bonds available for this process is given by the ‘Iodine Value’ (IV) and can be determined by adding iodine to the fat or oil. The amount of iodine in grams absorbed per 100 ml of oil is then the IV. The higher the IV, the more unsaturated (the greater the number of double bonds) the oil and the higher is the potential for the oil to polymerise. While some oils have a low IV and are suitable without any further processing other than extraction and filtering, the majority of vegetable and animal oils have an IV which may cause problems if used as a neat fuel. Generally speaking, an IV of less than about 25 is required if the neat oil is to be used for long term applications in unmodified diesel engines and this limits the types of oil that can be used as fuel. Table 1 lists various oils and some of their properties. As can be seen from Table 1, only coconut oil has an IV low enough to be used without any potential problems in an unmodified diesel engine. However, with a melting point of 25°C, the use of coconut oil in cooler areas would obviously lead to problems. With IVs of 25 – 50, the effects on engine life are also generally unaffected if a slightly more active maintenance schedule is maintained such as more frequent lubricating oil changes and exhaust system decoking. Triglycerides in the range of IV 50 – 100 may result in decreased engine life, and in particular to decreased fuel pump and injector life. However these must be balanced against greatly decreased fuel costs (if using cheap, surplus oil) and it may be found that even with increased maintenance costs that this is economically viable. Another method is to emulsify the oil or fat with ethanol. Goering  found that eight parts of soybean oil, when emulsified with two part ethanol and five parts of 1-butanol as stabiliser, performed as well as diesel fuel and was able to start a cold engine. The cost was calculated (in 1981) to be $0.40 a litre as compared to $0.30 – 0.35 per litre for diesel. Trans-esterifying triglyceride oils and fats with monohydric alcohols to form biodiesel largely eliminates the tendency of the oils and fats to undergo polymerisation and auto-oxidation and also reduces the viscosity of the oil to about the same as petroleum diesel. However as previously mentioned, the ‘back-yard’ production of use of does pose some risks, particularly to those who are not familiar with the handling of toxic and highly flammable liquids. In many cases, it is possible to use a variety of triglyceride fats and oils as a fuel. While engine wear and maintenance may be increased, in some circumstances these problems are not serious enough to prevent the use of the triglycerides as a fuel. An alternative to the use of biodiesel is the use of vegetable oil or animal fats as a fuel. The differences amongst fats and oils, whether of animal or vegetable origin, relate mainly to the level of saturation in the carbon chain. Generally speaking, the lower the number of double bonds, the higher the melting point of the triglyceride and the greater the stability of the triglyceride to polymerisation and spontaneous oxidation. From an engine use point of view, it is preferable to use saturated fats as fuels as they are more stable and less resistant to oxidation, particularly under the elevated temperatures and pressures as found in an engine environment. However due to their higher melting points, difficulty may be encountered in starting the engine without pre-heating of the fat. In order to test the viability of using relatively unsaturated oils in engines, a 1990 Mazda with a 2.0 litre indirect injection OHC diesel was obtained with a view of running it on various types of triglyceride oils and fats. At that time of purchase, the vehicle had covered 222,000 km. The previous owner stated that the engine head had been overhauled, but no further details were provided. Since the purchase, and prior to the conversion to operate on triglyceride oils, the injector pump was overhauled. Fuel consumption of the vehicle on diesel was stable at about 6.9 L/100 km. The vehicle is used as a family vehicle in a 2-car household. At the time of conversion (October 2000), the vehicle had covered 231,000 km. Waste palm oil (a solid fat) was used initially but the time delay in melting this oil prevented use of the oil on short journeys. Consequently, waste canola oil was tried and has been used exclusively for the last 7,500 km. At about 80 cSt (at 20° C), the viscosity of used canola oil is significantly greater than that of diesel which has a viscosity in the range of 2 to 4.5 cSt. [7, 13] However, as canola oil is warmed, its viscosity falls quite significantly and at about 70° C the viscosity is about 5 to 10 cSt. Thus the viscosity is sufficiently low to allow its use as a replacement fuel for diesel with out too much difficulty. The vehicle was fitted with an additional 17 litre fuel tank under the bonnet together with the necessary fuel lines, additional filter and a solenoid valve to control the fuel source. Electrical connections to a thermostat, glow plug, run-on timer, switches and the solenoid valve were also installed. The oil tank was fitted with a heat exchanger comprising one metre of 12 mm copper tube. This was connected to the engine coolant system and pre-heats the oil in the tank. The tank was located in the engine bay to maximise heat transfer to the tank and to keep the coolant lines short. The finished tank had a useable capacity of seventeen litres. This gave a range of up to 240 km between refuelling. Additional filtering was installed with an internal preheater. The pre-heater, a 24 V diesel glow plug, together with a relay and thermostat was installed so that if a solid fat was used for fuel, any solidified fat in the filter chamber could be quickly melted. The filter used (Ryco Z30) provides filtration to 30 micron. A vacuum gauge was fitted after the fuel filter and it was found that at start-up with cold canola oil, fuel flow was insufficient causing a vacuum in the fuel line and filter. An extra in-line fuel pump was added before the filter and this alleviated this problem and has increased fuel filter life. The heated oil fuel line was one metre of 5/16” semi rigid nylon tube encased in a 5/8” rubber coolant pipe. Brass fittings were used to ensure minimal corrosion and leakages of coolant. The three port, 12 Vdc solenoid valve was mounted in close proximity to the fuel pump to minimise changeover lag. The fuel return line to the diesel tank was redirected to the fuel pump suction side between the solenoid valve and fuel pump. This was done to prevent the oil in the return line going to the diesel tank. A disadvantage of this is that the fuel system became rather intolerant of air in the system. A run-on timer was installed using a modified ‘turbo timer’. After the solenoid valve is switched back to diesel, the timer keeps the engine running for a period of time, even if the vehicle is parked and the key removed from the ignition. During this period, the oil in the injector pump is gradually replaced by diesel and after several minutes, only diesel remains in the fuel pump, filter, fuel lines and injectors. The correct time was found by a trial and error. A manual override switch was also installed to allow emergency, or short duration stopping of the engine. The supplier of the used oil (a fast food outlet) filters the oil and puts it into containers for collection. To ensure that the oil is clean, the oil is heated and additionally filtered through a 5 micron bag filter. It was found that the used oil usually becomes cloudy and this was found to be a combination of the oil starting to solidify due to partial de-unsaturation of the oil from use and minor water content. If water content is suspected of being excessive, the oil is heated above 100’C to evaporate the moisture. To date, the vehicle has been driven over 7500 km using canola oil. In the morning, the oil in the tank is cold and quite viscous and a particular start-up routine must be used. In addition, if, at the end of the trip, the vehicle will not be restarted again for several hours, then a shutdown sequence must be followed in order to allow easy restarting. Glow plugs are used for all starts. When starting cold, the engine is started on diesel and the journey commenced. When the engine temperature has reached ‘normal’ as shown on the engine temperature gauge, the fuel solenoid is operated, and the journey continues using vegetable oil. For hot or warm starts, the engine is started using the vegetable oil. Shutdown: In the cooler months, at about 5 km from the end of each journey, the fuel solenoid is released. At the end of the journey, the ignition switch is turned off. If the time delay has not expired, the engine continues to idle, until the end of the delay. During warmer periods, the shutdown delay override switch is used to stop the engine for all stops, except for the last journey of the day. Using records of fuel consumption and distance travelled, there has been no noticeable difference in fuel consumption or engine power when operating on diesel, palm or canola oil. The fuel consumption has been found to be approximately 6.9 L/100 km, regardless of what fuel is being used. It is planned that full testing of performance will be carried out in the near future, taking into account different driving conditions and different fuels. Cold starting with canola oil: If the engine has been allowed to cool completely (eg overnight) and the shutdown routine not followed, then the engine may be very difficult to restart. 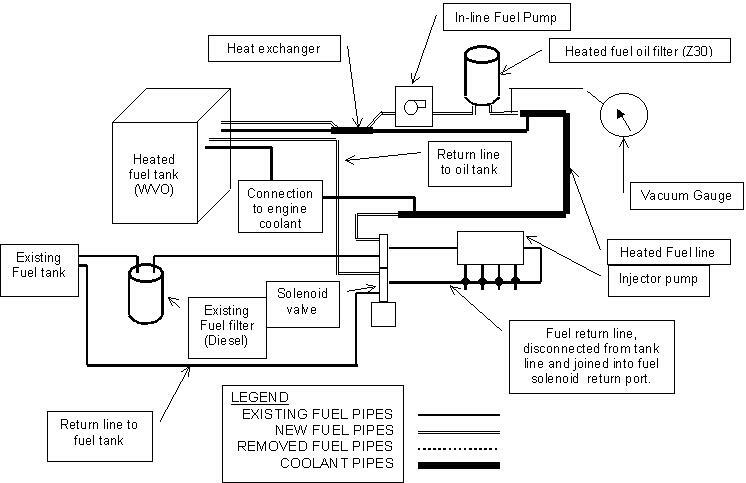 It has been found that heating the injectors by, for example, pouring hot water over them or using a hair dryer, will allow the engine to restart with no difficulty.Saturated oils: The use of saturated (solid) fats in cooler months would require significant improvements to the heat exchanger in the oil tank. Palm oil tended to solidify in the filter (prior to a glow plug heater being installed) and in the front half of the tank while travelling, reducing useable capacity. This may be less of a problem if a 6 port solenoid valve were to be used, circulating heated oil back to the tank, and improving the heating of the oil in the tank.Carbon build up causing wear: Reports have been made of accelerated engine wear due to increased carbon deposits in combustion chambers. [3, 4, 7] As the engine condition at the start of the test was not accurately measured, no proper evaluation of the wear can be made. However, at the end of the vehicle life, the engine will be dismantled and evaluated for any abnormal evidence of wear or damage.Galvanised Fuel tank: The oil tank was made from scrap galvanised steel sheet metal. It was found that the oil reacted with the zinc plating and this resulted in globules of reacted oil blocking the fuel filter on many occasions. The oil tank was consequently removed, cleaned and acid etched to remove the zinc coating. No reacted fuel globules have been observed since. Using free waste canola oil, fuel costs have been only for the diesel fuel used in the start-up and shutdown periods. Fuel purchase records for 10,000 km show the vehicle has used 240 litres of diesel. Driving this distance on diesel only would normally require approximately 690 litres of fuel. This represents a fuel cost saving of 65%. The conversion has paid for itself with savings in diesel purchases in excess of $400.Different usage patterns would give obviously give different results. Usage patterns for this vehicle show mainly short trips, with one or two longer (>20 km) journeys per week. As vehicle use increases, the diesel fuel savings would also be expected to increase. The only requirement for diesel, is that the motor must be allowed to reach operating temperature before operating on triglyceride oils, and that the oil must be diluted or purged from the fuel pump before shutdown. Due to higher fuel usage larger vehicles would be able to have greater fuel cost savings which would more than offset the increased costs of a remotely located oil tank.Obviously, if there were to be a greater demand for used and waste cooking oil, the oil may not be available free and the cost of purchasing waste oil must then be taken into account. While this would extend the pay-back period, as long as there was a reasonable difference between the cost of the waste oil and diesel fuel and any extra maintenance costs were not too excessive, it would probably still be economically viable to undertake the modifications and operate on used oil. Solenoid Valve: The use of a six port solenoid valve and an alterative fuel line set-up would reduce the shutdown delay requirement, as the return line would not be fed back into the fuel pump.Fuel filter: The provision of a heated fuel filter, using filter elements giving 5 micron filtration would protect the fuel pump from the possible 5 – 30 micron particles not removed by the Ryco Z30 filter. Filter heating would be most effective if heated by engine coolant. Biodiesel: Starting the vehicle on biodiesel would further enhance the environmental benefits obtainable. Many vegetable and animal oils can be used as diesel replacement fuels. The two ways of doing this are to either use the oil as a straight fuel or to convert the oil to a methyl or ethyl ester (biodiesel). Both of these ways have various advantages and disadvantages. One of the authors (Clark) converted a Mazda 626 to operate on straight vegetable oil and has done over 7500 km using this method. The other author (Calais) has been using biodiesel in an unmodified Toyota Corolla for over 20,000 km. In converting the Mazda 626 to operate on straight oil, a small tank was fitted under the bonnet of the vehicle. In order to minimise fuel ‘cold-plugging’ problems due to high fuel viscosity, both the tank, filter and fuel lines are heated. The vehicle is first started on diesel and then when the engine has reached normal operating temperature and the oil has been heated, a solenoid valve is operated which switched the fuel system over to the oil.To date there has been no evidence of increased engine wear, lubricating oil dilution or other problems. However the experience of others has shown that increased engine wear may occur but as yet it is still too early to determine whether or not this will occur in this example. Even so, the economic benefits obtained by using waste canola oil may more than offset any extra engine maintenance costs.It is hoped that continuing research on this project may provide more information about this in the future. 4. Parker, A.J. et al Transport Fuels from Biomass. Research Opportunities Symposium Proceedings, March 1980, Perth. 17. Sheehan, J., Camobreco, V., Duffield, J., Graboski, M., Shapouri, H. (1998). An Overview of Biodiesel and Petroleum Diesel Life Cycles. NREL, Golden, Colorado. Sims, R., (1996). The Potential for Biodiesel in New Zealand. Proceedings of Conference ‘Applications of Bioenergy Technologies’ Rotarua, pp 139 – 148 EECA. Sims, R., (1995). The Biodiesel Research Program of New Zealand. Proceedings of the Second Biomass Conference of the Americas, Oregon, pp 849 – 858, NREL.